Cact. J. (London) 2: 31. 1933 Nomen; Blätt. Kakteenf. 1934, Pt. 1, [p. 6]. = Echinopsis saltensis var. nealeana (Backeb.) J.G.Lamb. Cact. d'Argentine ed. 2 65. 1997 1998 J.G.Lamb. Accepted Scientific Name: Echinopsis saltensis Speg. This plant has usually somewhat larger solitary body than the near L. saltensis var. pseudocachensis, sometimes with long, curved central spines. 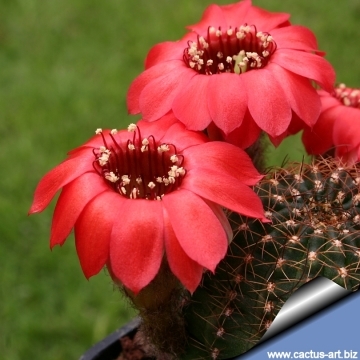 Description: Echinopsis saltensis var. 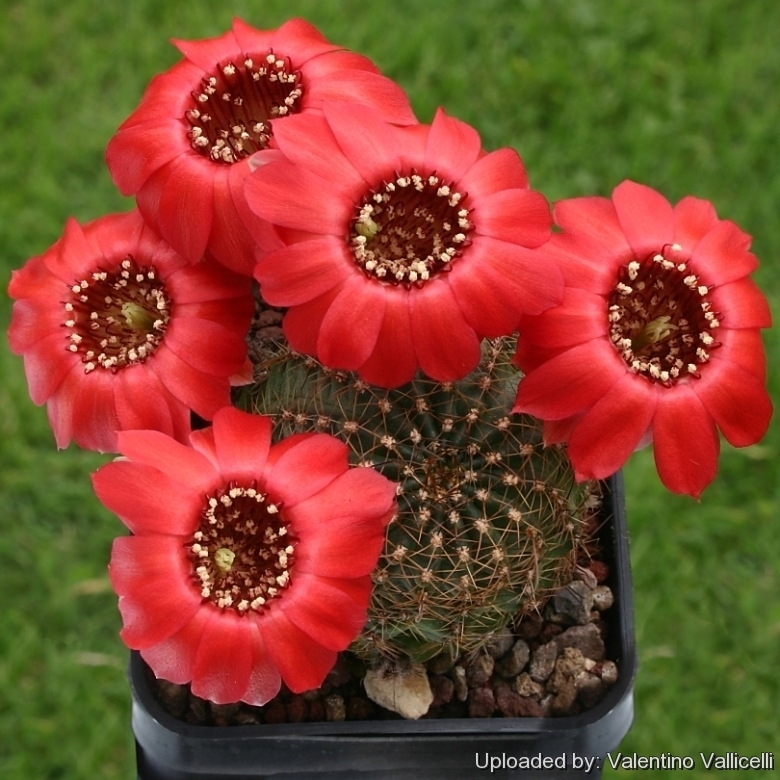 nealeana was firstly described as a variety of Lobivia nealeana Its appearance is very much like that of standard Lobivia nealeana but shows a somewhat larger solitary body, sometimes also with long, curved Central-spines, the red blooms are more spread and rarely yellow too. The fruit and seed are similar to those of the other Varieties. Habit: Small cactus, usually solitary, or heavily clustering. Stem: Flattish, egg-shaped or slightly elongated, up to 12 cm tall, 9 cm in diameter, bright green to dark green or almost black. Radial spines: 10-14 Thin, reddish. Central spines: 0 - 4 whisker-like, twisted, asymmetrical, more or less long, interlaced up and disorderly curved up to 3 cm long (This taxon comprises both individuals with or without central spines). The length of these spines greatly depends on sun exposure and plant's age. Flowers: Pretty, shining, small up to 5 cm long, unscented, somewhat bell-shaped-bulgy, dark orange-red or crimson that appears almost black when starting to open. The stamen's filaments are dark red, and bear cream-white contrasting anthers. The stigma lobes are greenish. Blooming season: The greater part of flowers appears in spring in the first flowering, but the plant can erratically produce some flowers in summer too. Fruits: Globular, 5 mm in diameter, with little brown wool, up-drying. 8) Urs Eggli, Leonard E. Newton “Etymological Dictionary of Succulent Plant Names.” Springer, Berlin/Heidelberg 2010. 10) Ortega-Baes, P. & Méndez, E. 2013. Echinopsis saltensis. In: IUCN 2013. “IUCN Red List of Threatened Species.” Version 2013.1. <www.iucnredlist.org>. Downloaded on 31 October 2013. Cultivation and Propagation: It is a summer grower species that offers no cultivation difficulties. Lobivia saltensis has a fairly large tap root, and should be kept in a deep pot with a very draining mineral substrate. Water regularly in summer (but do not overwater ) keep dry in winter. Feed with a high potassium fertilizer in summer. Repot yearly until reaching about 100 mm in size, then every two or three years will suffice. Repotting is best done at the end of winter but can be done at other times. Do not water for a couple of weeks after repotting to reduce risk of root rot via broken roots. Repotting will increase size of stems. It is quite cold tolerant if kept dry (hardy to -5° C). Outside it need a bright exposure, full sun or half shade in summer, inside it needs bright light, and some direct sun.